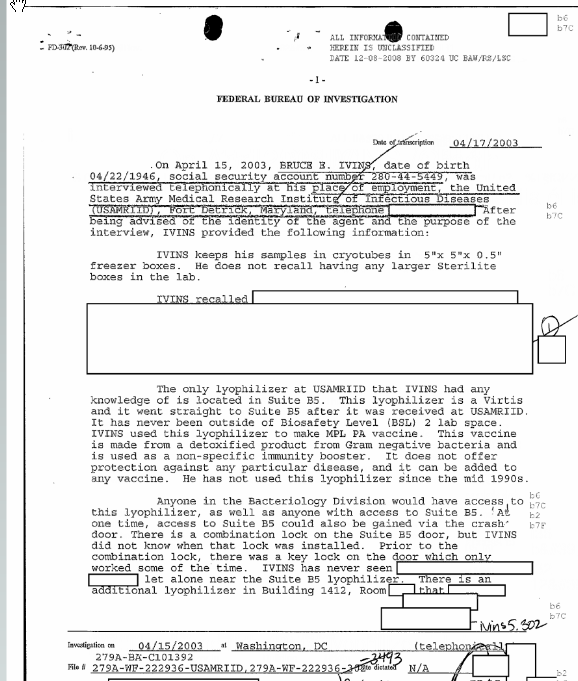 * The lyophilizer in Building 1425 was in Suite B5, not Suite B3 where Dr. Ivins was on the nights in question (where he was doing the study with the 52 rabbits) « CASE CLOSED … what really happened in the 2001 anthrax attacks? This entry was posted on November 11, 2011 at 11:13 am	and is filed under Uncategorized. Tagged: *** 2001 anthrax attacks, *** Amerithrax, *** Dr. Bruce Ivins, *** FBI anthrax investigation, Ivins lab work in late Sep 2001, lyophilizer, Suite B% not B3. You can follow any responses to this entry through the RSS 2.0 feed. You can skip to the end and leave a response. Pinging is currently not allowed. Dr. Vahid Majidi and his colleagues claimed at the August 2008 conference that Dr. Ivins used a lyophilizer to process the anthrax. The lyophilizer was not even in the B3 where Dr. Ivins provably was at those times. Where does Dr. Majidi address the issue of lyophilizer in his new manuscript on the Fall 2001 anthrax mailings? Wasn’t his manuscript a key opportunity to correct the mistake — and acknowledge that Dr. Ivins did not use the lyophilizer as United States Attorney Taylor claimed? Scientist Stephen Little explained in his sworn deposition that the lyophilizer in Ivins’ laboratory was outside the containment area and too large and heavy for him to move by himself into the air lock. Moreover, if Ivins had worked with dried powders of B. anthracis spores, the equipment would have been heavily contaminated, requiring the decontamination of the entire suite with heated paraformaldehyde gas—a complex and hazardous operation that must be performed overnight by building engineers, who keep meticulous records. The size of (and looking like) a large front-loading washing machine, how would he get it through the airlock of B3 by himself? And why wouldn’t the dry powder go all over the suite? (Years earlier, it had cost over $8,000 new). It was the 3 shelf Unitop HL 600 model. So he walked into B5 during one of his breaks, used the lyophilizer on instant and the maid cleaned it in the morning. Did he leave a tip? To get the silicon and tin he used latte setting and added those instead of milk.